This is the meatloaf recipe my friend's fiance served Sat night. I want to stuff my whole face with it, cause its that good. Wanted to share, cause I never think to make this and it was so good. That sounds fantastic! I am definitely trying that one. PS. I had it without the garlic sauce and IT is STILL fantastic. It's the garlic sauce that makes me keen! And all that yummy flavored oil for later too. @Stephie1020 - my husband makes that meatloaf too, on the rare occasions we have meatloaf. I like that it has no ketchup in the recipe, which I can't stand on meatloaf because my grandmother's never had ketchup. I was never a meatloaf fan till I had this one. For some reason I think its the Thyme but it reminds me of my Mom's meat stuffing that she would make at the holidays that I can't eat any more cause of the bread. So this is a great memory trigger for me too. I looked at the recipe and thought if I made this if have to cut it down a lot. I live by myself, love meatloaf and don't have any problem with leftovers, but 3 lbs of ground meat to start, aye yi yi. I just didn't compute - because if I am making a batch of ragu that's how I start. Didn't cross my mind that I portion that ragu up for about 8 portions! The success of that meatloaf can probably be attributed to using veal and pork with the ground beef. Americans tend to use just ground beef and it tastes great, but the veal and pork add a lot to the flavor. Also, it's not topped with the vial ketchup (I hate ketchup, so sorry). Definitely - the veal and pork round it out, and the pork tends to add necessary fat. Anyway, it was delicious! And I look forward to our sandwiches over the weekend. @foodycatAlicia I bet you can slice and freeze it too for future meals. When my friend made it for the party, there was a ton of leftovers too. An alternative to cutting the recipe down would be to make it as written* and portion out uncooked meatloaf in servings to wrap and freeze** along with the sauce frozen in an ice cube tray so you have an easy to thaw and cook meal whenever you feel like it. *I'd leave out the panko before freezing because it'll loose its umph during defrost most likely. **If you cook the meatloaf and then freeze it, you'll probably lose the juiciness and texture of a just-cooked meatloaf. This is what I'd try if I were only cooking for myself, anyway. I'd be concerned that in cutting down the recipe too much, the herbs and other ingredients that are already in relatively small quantities will be lost. @DeDe that's a very good thought! As it happens we managed to finish it over the weekend, just snacking. But next time I will follow that suggestion. @DeDe that's a great idea too. I love having meals ready to go in the freezer. I made a turkey meatloaf last week, added pretty much every veggie I had on hand (chopped/sautèed/cooled/added to mixture), turned out really good, but will definitely try this one soon. Ina reminds me a bit of my dear mom who passed away almost 3 decades ago, so I've always automatically loved everything that Ina has done. @nolakent ; The single best thing I’ve ever cooked was Ina’s Boeuf Bourguignon, which involved so much butter and bacon that I was frightened. It was also the first time I ever poured cognac over a dish and set it aflame! We even did the part that sounds really strange: served it over thick, garlic-rubbed slices of toasted Country bread (bought from Panera, lol). Stunning. RE the meatloaf – anyone try this leaving out the veal and using 1-1/2 pounds each of beef and pork? I was surprised to see that the garlic sauce cooks at a full boil for 35-40 minutes! Just wish I had containers of gorgeous, gelatinous, homemade stock waiting in my freezer, as Ina always does on her show. Thanks for sharing this, @Stephie1020. @WinterWhite ; I generally tend to make Ina's healthier recipes, or alter the less-healthy ones just a bit to strain out of tad of the guilt! I saw one of her shows last week that was filmed in Paris and I found myself tearing up. I want to be in Paris, with a devoted loving partner, visiting old favorite spots; that is my definition of heaven. @nolakent Paris is my second home. I got to live there after college and It will always be where I want to be. It's truly magical. @nolakent ; Ina, for all her warmth and graciousness and touch of endearing awkwardness, does seem to send a lot of us to that place...I think she and Jeffrey have tempted more people into the deadly sin of Envy than Satan himself! For me, it’s the wish for a little house/garden to love, and lots of laughing friends to pamper there with food and wine. I haven’t 'entertained' at all in years – and will probably never get to live out my Ina/Babette’s Feast-hostess fantasies. 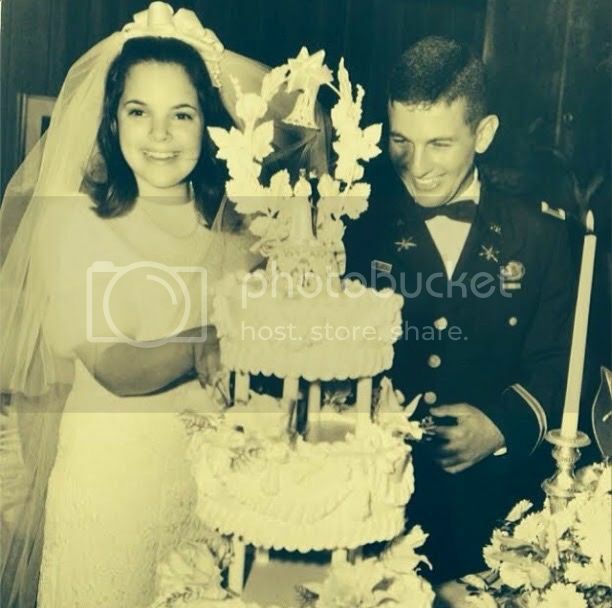 Aww: Ina, 20, and Jeffrey, 22, at their wedding! It really seems that both of them were fortunate in original circumstance, lucky in love, and have made a lot of great choices in their lives. The triple-cherry jackpot. Aww, that photo of them as young children is awesome! I read that she was 15 when they met. I love her so damn much. She just makes it look real, as well as flawless. Like Martha you know there's a team behind all that. With Ina, while I'm sure there' s a team too, it doesn't come across that way. She makes everything look delightfully easy. When I have parties, its stress case city. My meatloaf is in the oven right this very minute. Boy that is one huge loaf. I did half the amount of salt though, making sure I used kosher salt too. I was horrified at 2 Tablesoons, that is asking for an early stroke. I shall report back. Meatloaf was good, MrQ liked it better than I did. The garlic sauce was delicious. I liked it thinner so didn't thicken it like gravy. It sank right into the meat slices. I also only cooked it about 20 minutes, then whizzed it a bit with the stick blender. It would have been too salty if I cooked it down longer because of the stock I used, so I didn't add any salt to the sauce. I'm not sure but it may have been the taste of the veal that put me off it a bit. I would try it again, either with lamb or turkey substituted. It will make a lot of servings but my guys like meatloaf sandwiches so it will disappear, or Zillow freeze leftovers. What the heck, Zillow? No no I will freeze leftovers. Stupid spellcheck! I'm so glad you enjoyed it @Qitkat. Good to know about the salt. I always cut the salt in recipes too. I plan on making this tomorrow and splitting it in 3 portions. 2 for the freezer (following @DeDe's suggestions) and 1 for the week. Can't wait! I've made this and meant to come back here and comment. First off, it IS delicious. And I really loved having the extra oil leftover. I've used it quite a lot since I made the meatloaf. - Did anyone find it a bit salty? I will reduce the salt by half the next time I make it. - The sauce was good, but being southern, it didn't like the consistency--it was too thin. (And to be fair, I think part of it was my fault because I didn't look at the time it took to make it and so I didn't cook it for the recommended time). I'm going to take the leftover sauce I froze and make a roux out of it and make into gravy so it sticks to the meatloaf.